Red-green color blind? Download the patch. Want to know the hidden cheats and achievements. Interested in how everything works, download the source code. Best GM puzzle game around and easily up there with the best of the non-GM and commercial puzzle games. Damn fine work. Completely professional standard. Synopsis: Bacteria 2 is a difficult logic puzzle where you must take over the entire territory of stones before your opponent does. 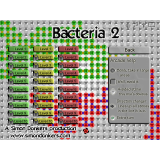 If you enjoyed the original Bacteria (which can also be downloaded off of the above website), or even if you haven't played it but enjoy difficult puzzle-games, you must try Bacteria 2! 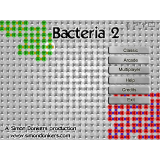 Bacteria 2, inspired by the game Disinfect the core, is easy to play but difficult to master. The sequel brings back much of the classic feel with several added twists, allowing for even more fun than the original. Point, click to rotate, take over your opponents stones before he, she, or the AI takes over yours... that simple, right? WRONG! 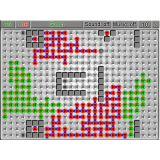 Every move that you make must be a calculated one or, with relative ease, the improved computer AI will overwhelm you, trapping you in corners and infecting the last remaining stones that you have left. The rules are simple: click any stone of your color to rotate it. If the stone points toward an unoccupied stone or an opponent's stone, you "take over" that location as well as any stone that it is pointing to or is pointing to it. The game can have its easy moments, but the overall game in itself is by far not so simple. The Classic "Single Player" mode is back, of course, where the battle is between you and a very well-designed AI (now with Easy, Normal, and Hard AI difficulty levels) on randomly-generated boards, but that is only the beginning! In the new Arcade mode, you can play 30 pre-designed levels which contain new, special "stones" not seen in the original game. Reaching one of these stones can easily alter the outcome of your current game. Special stones include Bomb Stones which help you to capture large areas of stones with a blast, Wall Stones which block your path, 4-Sided Stones which point in all four directions instead of only one, Direction Changer Stones which line up all stones in a row/column in the direction of the stone's arrow, and Extra Turn Stones for a free turn. Bonus levels (which can be accessed by beating the game in specific places or a certain number of times) and cheat codes are also nice additions that extend the gaming experience (but remember... cheaters never win, so don't think that you will complete the most difficult Arcade levels that way!). The animations of rotating stones and especially the taking over of large groups of stones is highly unusual and almost hypnotic. It can actually be fun to set up take-overs merely to watch as the stones blend from one color to the other slowly as they infest one another. The menus and intro screen animations also give the game a very professional look and feel. 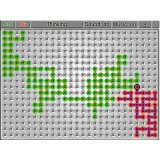 The "last move" beacon, a new feature in Bacteria 2, has its pros and cons: it is helpful in better-knowing the last move made by an opponent as your eyes can sometimes get lost among the multitude of stones but can easily become irritating to see during a fast-paced game when you are certain of your opponent's moves or a series of moves are being made rapidly close together. Another feature, available as a patch on the website, darkens the green stones to almost black so that those with red-green color-blindness can much more easily see which stones are which. This is a minor detail to most but greatly appreciated by those who need it. The sound effects are simple and effective. Explosions, clicks, rattles, zings, blings, and of course the AI-taunt (yes, the computer laughs at you at random when it takes over a large portion of your stones) may be the only sound effects in the game, but what more is needed? Each fits the game well for its own purpose. The music, though nice, does not seem to fit the theme of the game in my opinion, however. The light-hearted nature of the intro music fits perfectly, but that same music during gameplay does not have a similar effect which I felt should have been more dark or mysterious. This is, of course, only my opinion. If you prefer, you have the ability through both buttons and shortcuts to quickly turn off the sound effects, music, and taunts, or any combination of the three. Recently, the creator of this game (Simon Donkers) released the source code. It can be downloaded at the above website, but you must have a registered copy of Game Maker 6 installed to run it. To register your copy of Game Maker, go here. In all, this is a great sequel that far surpasses its predecessor. It is very entertaining, challenging, and visually appealing; it is my favorite game of this type; and it is certainly, in my opinion, one of the best overall puzzle games ever created with Game Maker. Here are some reviews about the game or an article about the Artificial Intelligence.